Reflective Art Brings Light, Color To Historic Spaces Swarovski crystals and chicken wire are just two ingredients of landscape artists Xavier Perrot and Andy Cao's work. Their installations at a one-time leprosarium outside Paris and in D.C.'s Dumbarton Oaks are informed by the history and space that surrounds them. 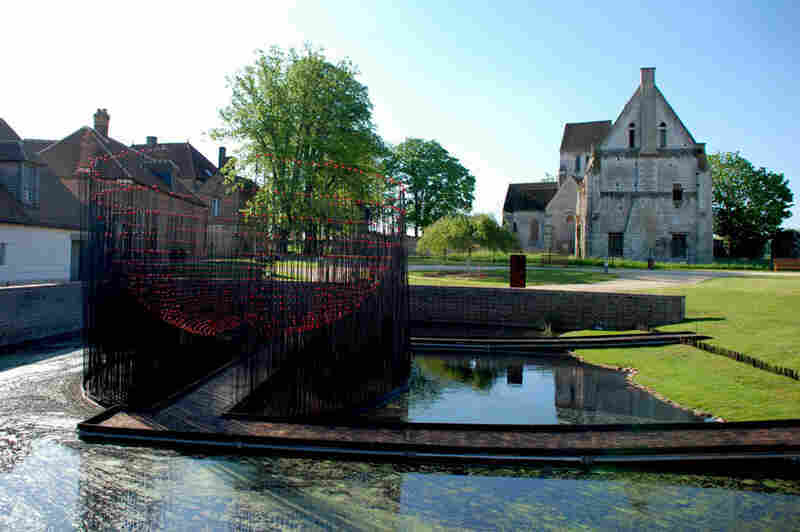 Andy Cao and Xavier Perrot's Red Bowl installation in Beauvais, France, allows visitors to cross a pond into a hemisphere of metal rods topped with red marbles. The marbles recall the way lepers once bathed in animal blood in an effort to cure themselves and avoid being ostracized to the one-time leprosarium where the installation is located. Cao and Perrot's White Dome hangs inside a free-standing tower that used to be part of Beauvais' Saint-Barthelemy Collegiate Church. According to the artists' website, the crystals that hang in the tower are meant to serve as symbols of the soul's purification by ascension to heaven. Cao and Perrot's Cloud Terrace was designed to extend the shade of surrounding trees across the terrace it adorns in Washington, D.C. The installation, on display in Georgetown's historic Dumbarton Oaks Gardens, combines the luxurious (crystals) with the mundane (chicken wire). This is a story about amazing beauty, imagination and magical effects — and it begins, ironically enough, at a one-time leprosarium, or hospital for lepers, in Beauvais, France, a small town outside Paris. Lepers were sequestered in Beauvais in the 12th century. That history is now noted in an outdoor art installation made up of slim metal rods that curve up into the shape of a bowl. 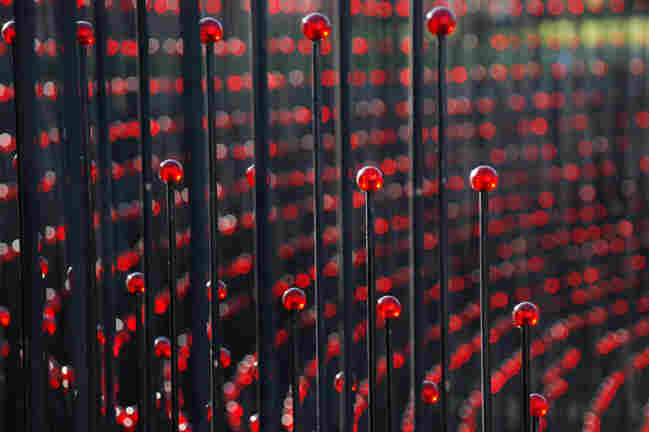 Each rod is tipped with a red, marble-sized glass ball. Xavier Perrot and his partner, Andy Cao, are the 30-something landscape artists who created the work, called Red Bowl. Perrot explains that they chose red as a reminder of how, in medieval times, lepers bathed in blood hoping for a cure. If the blood "cure" didn't work, they were banished from society, and made to wear a shroud and carry a wooden noisemaker so townspeople could hear them coming and run out of their way. A priest would pronounce them dead, and family and friends would march them to a dormitory that sits behind thick stone walls on the outskirts of Beauvais. Arriving there, the leper would kneel and have dirt shoveled onto his back. "In a symbolic way," Perrot says, the leper "is buried, and that's the end of his life, at least on the outside. That means he is no one outside of these walls." Today, the former leprosarium — known as the Maladrerie Saint Lazare — is a bucolic, pleasant scene. 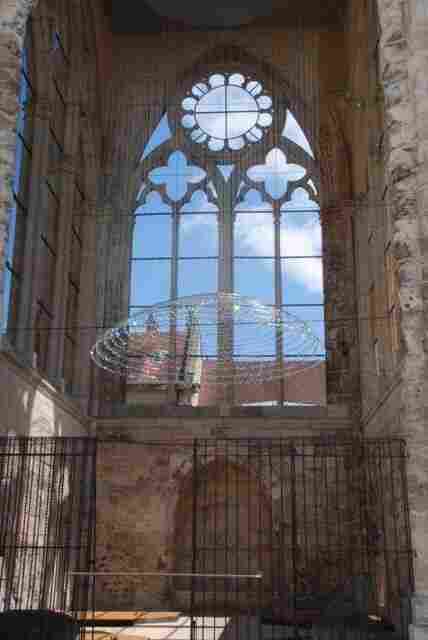 But the windswept, blood-red glass of Perrot's installation reminds visitors of a grim past. In town, Perrot and his partner have another installation that uses wind and light to animate a historic structure. Built in the 13th century, the Saint-Pierre Cathedral is a carefully restored, gothic tourist attraction. It stands just a few steps away from what's left of the Saint-Barthelemy Collegiate Church, where a religious order once preached and prayed. Today, the remnant of a Saint-Barthelemy tower glistens with a Cao-Perrot installation called White Dome. Light bounces off 1,000 almost-invisible nylon filaments — or fishing lines — that descend from a dome at the top of the tower. The nylon lines hold a series of wire rings that form a kind of hoop skirt that's adorned with 3,000 tiny crystals. When the sun hits the tower, the fishing lines turn silver and the crystals — made by the world-famous Austrian company Swarovski — shoot off rainbows of light. It makes for a beautiful dance of light and color. Both White Dome and Red Bowl were commissioned by the town of Beauvais, which is also known for its elaborate 17th- and 18th-century tapestries, as a proud nod to its history. They're showing through mid-September. Birthing 'Cloud Terrace' In D.C. In the U.S., Dumbarton Oaks — a historic, 10-acre garden in Washington, D.C. — is also ablaze with colors. It has roses, azaleas, lilies and a new, temporary installation by Cao and Perrot. The pair arranged tree-high poles into an oval shape, and on top of those poles they perched a configuration that pairs luxury with something very basic. 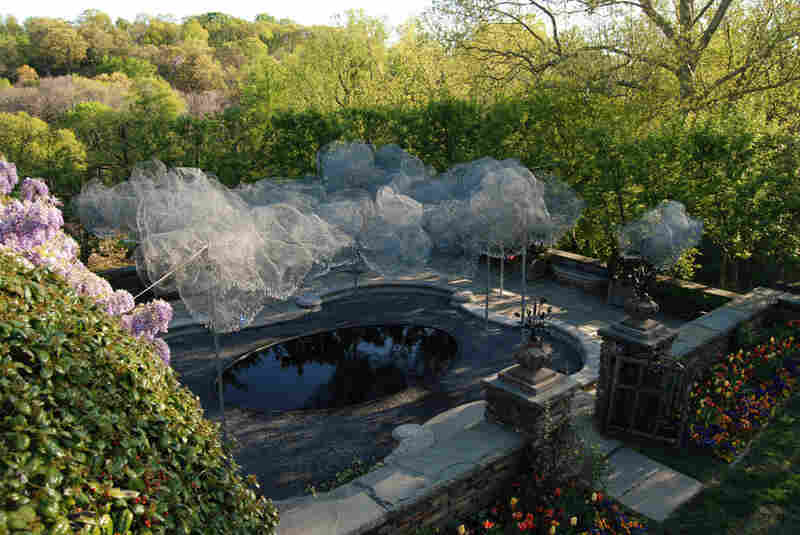 "It's a wire mesh cloud made of two different gauges of chicken wire," says John Beardsley, head of the garden and landscape studies department of the Harvard research institute based at Dumbarton Oaks. 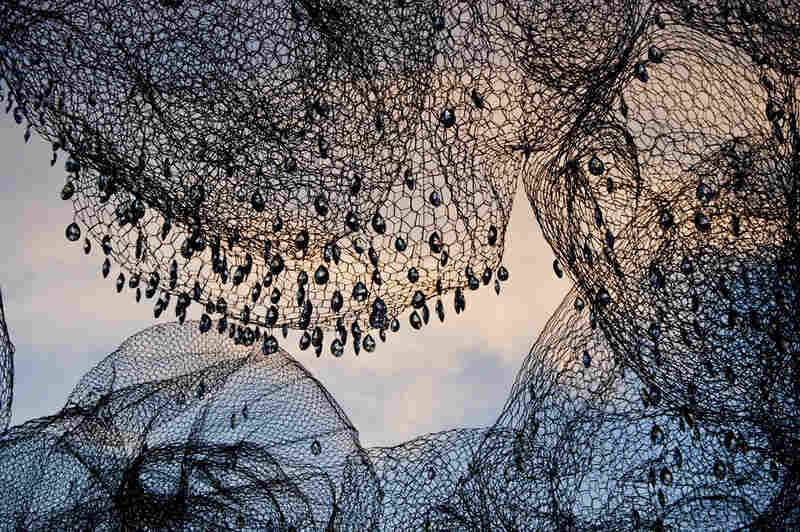 "It's just plain old chicken wire... folded into elaborate shapes that evoke a big bank of cumulus clouds. 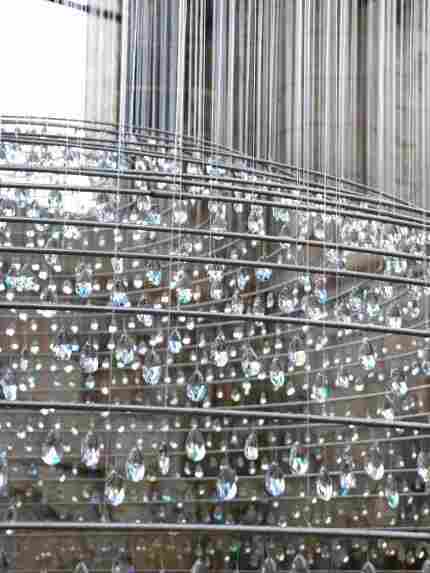 And then it's hung with 10,000 Swarovski crystals." ... in tough times, art is more important ... keeping the spirits up and the soul alive in difficult economic circumstances is terribly important. Like those at Beauvais, the crystals at Dumbarton Oaks are on loan from the Austrian company. All 10,000 have been hand-tied to the chicken-wire cloud, where they cast prisms everywhere. On a cloudy day, they glimmer like raindrops. "And then it's all reflected in an oval pool that the designers created to reflect it in," Beardsley says. Between sculpting the wire mesh and threading and tying each of the cut crystals, it took the landscape artists and some volunteers a month to make Cloud Terrace, which is open to the public through November. Until the actual installation, Beardsley had only seen drawings of the piece. He says he was relieved when it was finally in place. "It's a birthing experience," he says, laughing. "We gave birth to 10,000 crystals and a wire mesh cloud." "There's also the saying that, in tough times, art is more important," he says, "that keeping the spirits up and the soul alive in difficult economic circumstances is terribly important."